Meguiar’s Hybrid Ceramic Wax is the new face in wax technology. This sophisticated wax hybrid uses a high-viscosity formula to form a protective layer on the exterior of your car with an easy application. No rubbing, curing, or buffing needed. Simply spray on, rinse off, and watch the magic happen! Meguiar’s Hybrid Ceramic Wax is designed with advanced technology to bond to your exterior paint and form a thicker coating that is long-lasting and durable without the elbow grease. This simple solution has superior UV protection and is more chemical resistant than standard wax and requires half of the application process. Now all you need is a freshly washed car, water, and your favorite microfiber drying towel to see immediate results! Meguiar's Hybrid Ceramic Wax is so simple that you can just spray on and rinse off! To use, spray directly onto wet vehicle after washing and rinsing. Rinse again, using a strong stream of water. Dry vehicle with a quality microfiber drying towel. 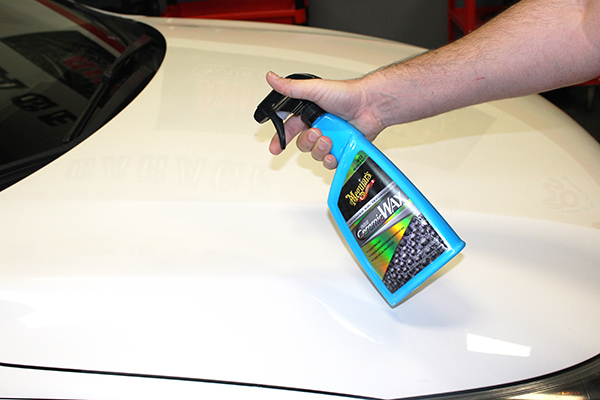 For optimum results, use with BLACKFIRE Car Wash and SONAX Microfiber Drying Towel.